Its powerful repetitions are very pleasing. Students tap their feet to the rhythm of each line. Thinking of Walt Whitman, as well as my own Hebrew Sabbath prayers, I wonder if the children are reminded of Islamic prayers. Walking around the classroom, I glance at first drafts as students compose. Two wonderful poems stand out, written Zubair and Zayd. These thoughtful twins have written poetry for three years, since I begin lessons in first grade at this large Islamic day school. 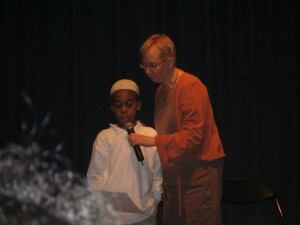 When asked about the title of his poem, Zubair says that this is the poem of his life. His brother, Zayd, is quite concerned with the environment and what he can do to care for it. until this age or year. I am nine. And my God looks like. I will see angels and different sources. I stand in good relations to who loves me. I will be my best. I’m heading where you’re heading. That’s who, what, and where I’m heading and what I am. I dream of who I really am. I wish to have a good heart. I see my true niceness. In taking care of earth. I love all my environment and its path. Around all my relations is my heart. I go through my paths as well. I go home feeling optimistic and refreshed, although it’s been a long day. That morning I co-taught some eighth-grade workshops at St. Francis de Sales in West Philadelphia alongside Priscila Sanchez , a charismatic, young teaching artist from Camden. She has recently joined ArtWell, our arts education nonprofit that seeks to promote creativity,enhance communication and literacy skills, deepen understandings of self and community, anultimately reduce violence and increase peace within our city and region. It’s a wonderful mission, filled with talented directors, poets, artists and educators, as well as a board whose meetings often feel like family gatherings. Yet, sometimes our work feels a bit all-encompassing. It can be hard to witness the stress and pain that children sometimes express. There’s not enough time to get to know each child well, since we work with so many wonderful students. But, we try our best, and model the practice of deep listening in each workshop. We help students express themselves through writing and art, hoping they will use these skills throughout their lives. Lately, though, teachers in several of our partner schools have whispered their fears that their school may not be around next year—due to budget cuts. This morning I signed a petition to the Upper Darby school district, which proposes elimination of elementary school music and art classes, physical-education teachers and librarians. It’s mind boggling. We know that it’s important for children to share their feelings and life experiences with others; one excellent vehicle is through the arts. Geraldine A. Buck, from Drexel University’s School of Public Health, recently finished her doctoral dissertation which examined our We the Poets program, (Advancing Positive Youth Development Through the Arts). She found that it helped students move away from negative and passive approaches to more reflective and expressive ways of responding to stress. But you don’t need to be a doctoral student to feel the power of what students express . but can anyone see what I feel inside of me? or the pain that I sometimes feel inside? because all they look for is lies. but how can you tell when your heart has had enough? that’s how you know that your heart has reached its peak. but to tell how someone really is you have to look deep inside to find the truth. No matter what the challenge, I am grateful to be part of ArtWell, a relatively small nonprofit with enormous dreams . Each day I renew my commitment to the children in our community. I read their poems, help them develop as writers and artists, and hear their stories. As they gain strength and confidence, I dream that they will extend themselves into the larger community–for we are all family on this earth. I write poems myself, and often find that I am writing poems from my students. Even when I tell my own stories, I circle back to them. the pure blue of sky in the center of summer? Or birdshell blue, or the dark slate of a storm? I don’t know if you have sisters. the other’s voice sounds like mine. We had a brother, but he is no more. I tuck his name under my ribs. You can hear it when I breathe softly. from pictures and bits of old words. You can help. We can mix our alphabets together. over the wide, blue air for an hour. until you call me sister? Cathleen Cohen is the Education Director at ArtWell (www.theartwell.org). She lives in Wynnewood, PA, where she and her husband raised their children. A poet and painter herself, she feels lucky to have spent many years teaching these art forms to children of all ages.